“I wanted to write” (52) reveals Hymie Fagan. Quite simply we know his purpose. His memoir titled, ‘An Autobiography’ holds no significance, yet it is broken into two stages; ‘Childhood Memories’ and ‘Adulthood’. During his childhood, Fagan experienced a humiliating setback, reminiscing “I showed a short story I had written about the name of our house “St.Helens” but my friend only laughed at it” (52). This humiliation nonetheless strengthened his desire to write, materialising into his working-class autobiography. The autobiography is narrated in a chronological format, beginning with his childhood, and leading up to the days of his retirement. His childhood exposes the hardships of poverty, conveying the working-class experience of child labour in the textile industries of London. This is a sharp contrast to his adulthood years where social mobility is considered. Despite his working-class rhetoric, a middle-class identity is formed through the change and progress of his employment. 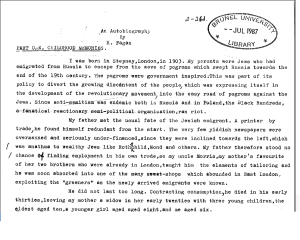 At the beginning of the autobiography Fagan states, “My father met the usual fate of the Jewish emigrant…he found himself redundant from the start…and he was soon absorbed into one of the many sweatshops” (1). It would appear that Fagan feared the conventional ‘fate’ of the emigrant in nineteenth-century London, reinforcing his aspirations to surpass the working-class struggles and oppressions. In light of this, Fagan’s memoir is a reflection of how he has overcome the challenges of the Jewish, working-class male. The biography is therefore significant in revealing discrimination during the nineteenth-century, which could be of interest to anyone researching working-class minorities or the history of Jewish immigrants in the East End of London. 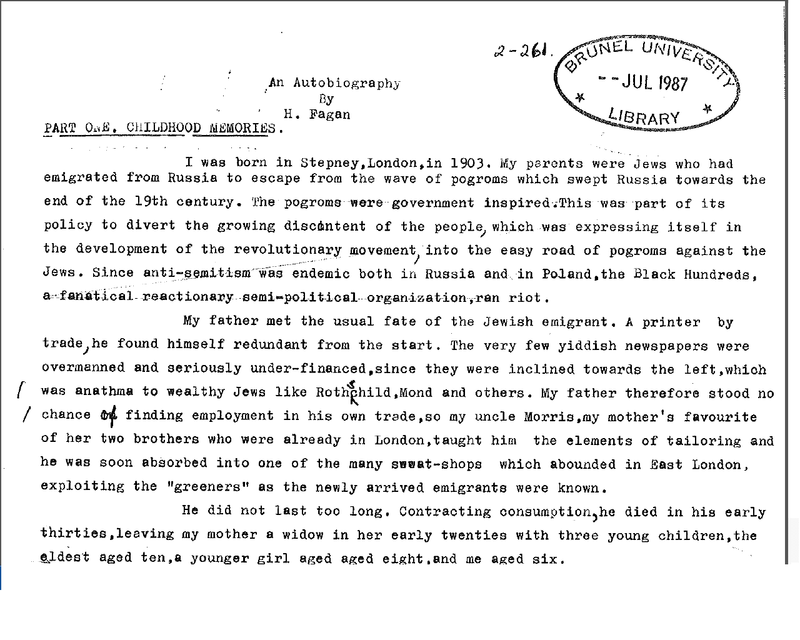 Considering when the account was written, there is the assumption it would have been produced between the date of his retirement in 1968 and his death in 1988, given it was published by the archive in 1987. Since there is no specific date, it is hard to direct Fagan’s motivations as to why he wrote his autobiography. The historical elements to his autobiography would suggest that it was very much anticipated for a political audience. He provides the reader with an insight into the politics of Britain nationally and internationally, which could also appeal to historians reviewing Britain’s political situation during the turn of the century. Fagan’s autobiography can be recognised with the form of the ‘political narrative’ (Gagnier 350). Regenia Gagnier in her study regarding nineteenth century working-class autobiographies asserts that within the political narratives the ‘private selves cannot be divorced from their political projects’ (Gagnier 351). Not only did Fagan spend forty years devoted to political work, but he states, “I was more concerned with myself than with my duty to the family. Now, I was deeply involved with the party” (63). This can explain why the autobiography is so heavily generated towards a political audience, because politics became embedded within his personal life. 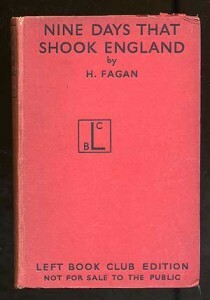 Fagan’s autobiography can be compared to the publication of his book, Nine Days That Shook England an account over the 1381 peasant’s revolution in England. 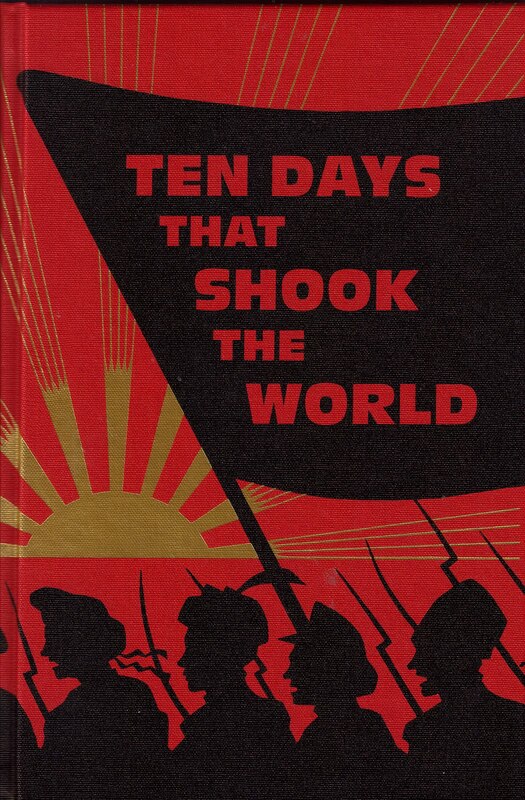 Fagan models the work of John Reed’s book Ten Days That Shook The World which comments on the 1917 October revolution in Russia. 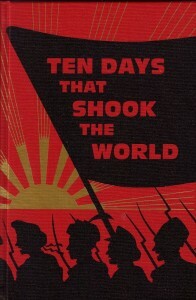 Fagan writes, “I had written the book not as an objective historian, but as a partisan, a supporter of the revolt, just as Marx had done when he wrote of the Paris commune” (108) given his desire and interest to write a history, it is interesting that he compares himself to the political figures of Marx and Engels, who catalysed the study of the working classes. Writing was clearly a passion for Fagan, especially his enthusiasm to write as he remarks, “the book was so clear in my mind that it only took six months to write” (107). In revealing so much about his desire to write the book, it is questionable as to why he excludes the purpose for writing his autobiography. In researching further into Fagan’s published works, I came across a collection in the British Library online. In 1983, Fagan and his wife Marion contributed to a collection of works in, Childhood memories: recorded by some Socialist men and women in their later years, which includes Fagan’s ‘Childhood Memories’ from his autobiography. Fagan’s autobiography and many of his other writings, represent the importance of the working classes in British society as it remained, in the words of George Orwell, ‘the most class-ridden country under the sun’ (Cannadine 144). Cannadine, David. Class in Britain. London: Yale University Press, 1998. 144-160. Gagnier, Regenia ‘Social Atoms: Working-Class Autobiography, Subjectivity, and Gender’ Victorian Studies, 30 (Spring 1987): 335-363.